Got Craft Blog: handmade nation - tickets now on sale! I am so excited to announce that the new Got Craft website is now up! This is a one stop shop for all of the information that you need to attend or participate in our upcoming shows. Vendors now receive an image on the website as well as a link back to their site and their very own page where they can post more pictures! Everything is laid out clearly and the website is easier to navigate. I love it and I hope you do to! To celebrate the new site, Got Craft? is proud to present the Vancouver Premier of Handmade Nation. Traveling across the world to sold out crowds, it is Vancouver’s turn to join the handmade revolution! 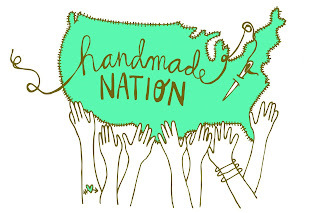 Join Director Faythe Levine, July 9th, for Western Canada’s premier of Handmade Nation. Be the first in Vancouver to see the film, meet Faythe Levine and participate in a Q&A session after the screening. Tagged as the ‘Ambassador of Handmade’, Faythe Levine has traveled 19,000 miles to document what has emerged as a marriage between historical technique, punk culture, and the D.I.Y. (do-it-yourself) ethos. Tickets went on sale this morning and they have been coming in fast and furious! Space is limited. First 100 sold receive a free swag bag. For more information about the event or to purchase your tickets, please visit Got Craft?. Swag bag participation! If you are interested in submitting items to the swag bags, please contact us. Lovely tote bags have been donated by Craft Stylish!